The 3M Lint Roller is the easy, convenient and effective way to remove lint from your clothing and it is the only one with proven Scotch brand adhesive. Because it’s Scotch brand, you know it’s superior quality and it feels better to hold and use and the easy-to-remove perforated sheets are polypropylene, not paper, so they won’t tear, rip and bunch up. The Scotch adhesive in 3M Lint Rollers has the perfect balance of strength and control. It’s ultra sticky to remove maximum lint but it won’t damage fabrics or leave sticky residue behind andfor those who share their homes and lives with furry friends, will know just how that fur can end up absolutely everywhere. But the 3M Lint Roller makes light work of getting rid of all that hair. 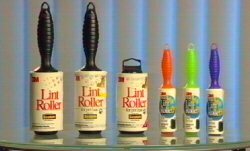 Lint can go everywhere you go, 3M have also come up with the 3M Mini Lint Roller. A smaller, easy to travel with model that’s just as efficient. Now you can look your best anywhere at any time, in just a few seconds, and when you run out of adhesive sheets, just pick up one of the 3M Refill Packs. When it comes to looking your best, turn to the brand you can trust. The 3M Lint Rollers with Scotch brand Adhesive will keep you lint and fur free. 3M Lint rollers are the only ones with Scotch brand adhesive and they’re available at selected supermarkets & retail outlets.